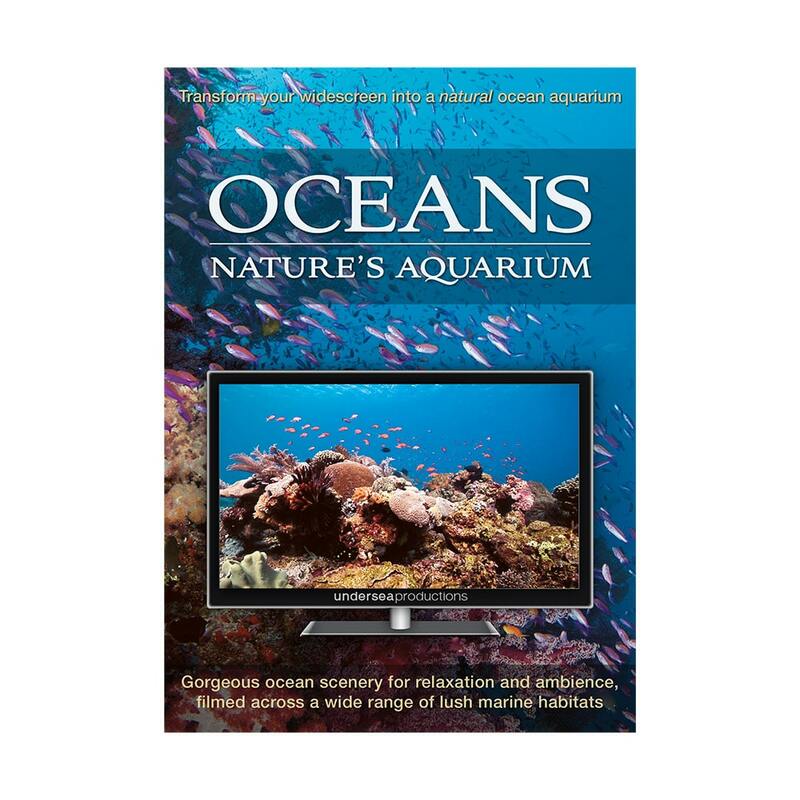 Oceans: Nature’s Aquarium brings you lush underwater scenery for relaxation and ambience. It transforms your widescreen into a natural undersea aquarium. Enjoy an hour-long collection of 65 gorgeous, seamlessly unfolding ocean scenes. From the diverse seascapes of Australia, Fiji, Indonesia, Tonga, the Solomon Islands and the Galapagos Islands, Oceans: Nature’s Aquarium is a visual celebration of marine biodiversity: colourful coral reefs, rich sandy slopes, current-swept channels, shallow seagrass meadows, and bottomless drop-offs… all teeming with tropical fish and unusual critters. Professionally filmed using high-end optics and super-wide lenses for outstanding picture clarity, the stationary camera creates an ever-changing window on the underwater world. No dialogue, no story, just sheer beauty. The exquisite visuals are enhanced by your choice of digital audio: peaceful music, or natural undersea sounds. 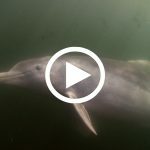 Switch on the optional commentary and/or subtitles from our marine biologist and award-winning underwater cameraman. Follow along as he shares his knowledge of marine ecosystems, and reveals the filming stories behind the shots. 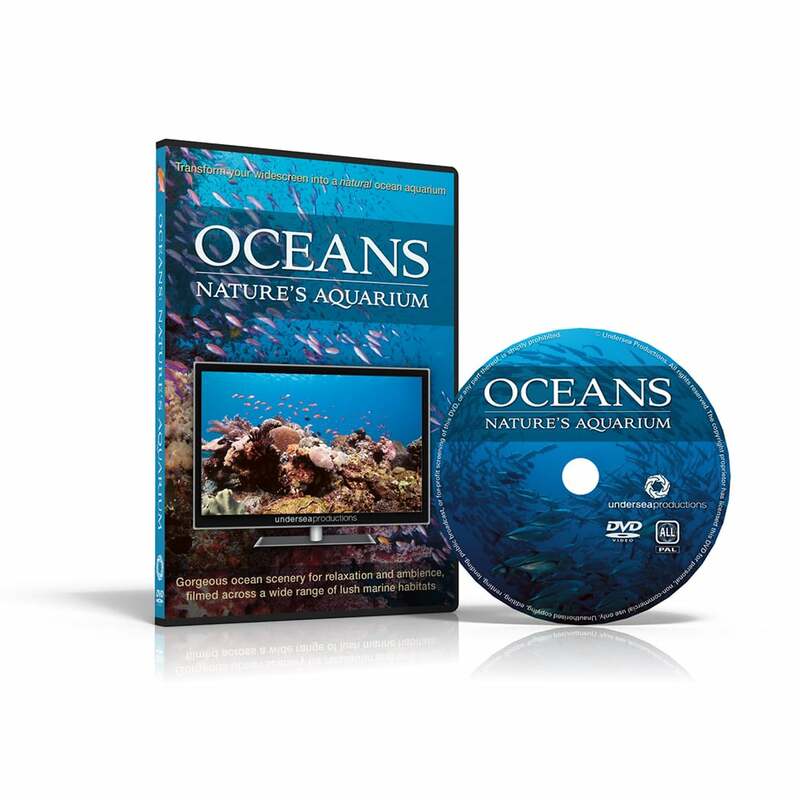 The DVD can be looped for continuous playback of all 65 ocean scenes, designed for uninterrupted enjoyment. 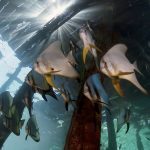 The 10-minute bonus featurette, Artificial Reefs, shows man-made structures and historic shipwrecks, decorated with anemones and sponges, and bursting with fish life. 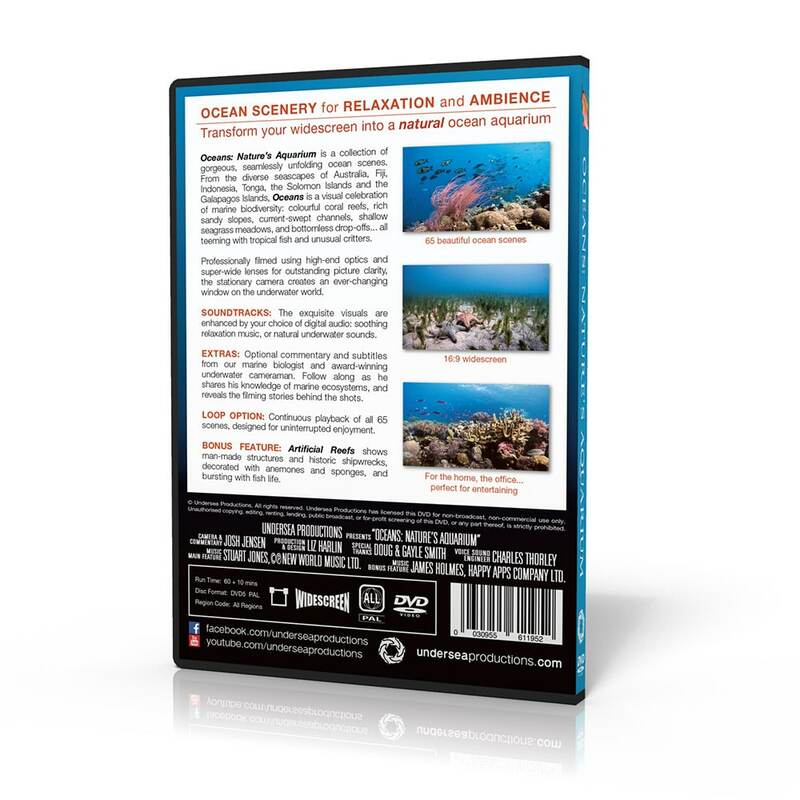 Filmed with utmost care and respect for the marine environment. One professionally filmed and produced DVD containing a Main Feature (60 minutes) and a Bonus Feature (10 minutes). Should I order PAL or NTSC? PAL and NTSC are TV picture formats. Some countries use PAL, other countries use NTSC. This means that a DVD from a PAL country may not play on a television from an NTSC country, and vice versa. 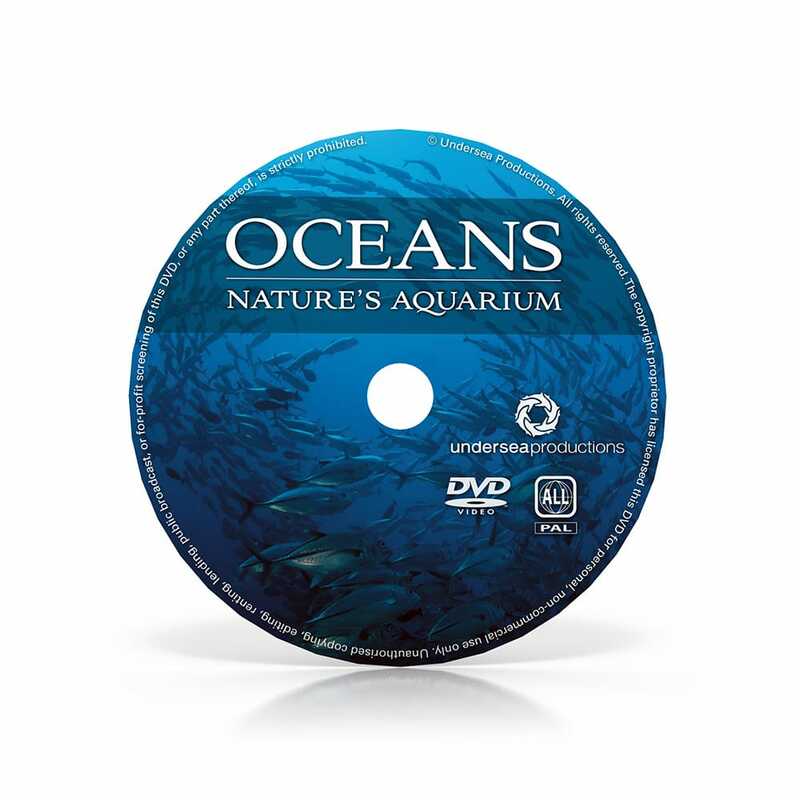 We sell our DVDs in both formats, you let us know which one you need. All our DVDs are “Region 0” (also called “Region All”), which means the DVDs will work on all DVD players regardless of the player’s specific regional coding. 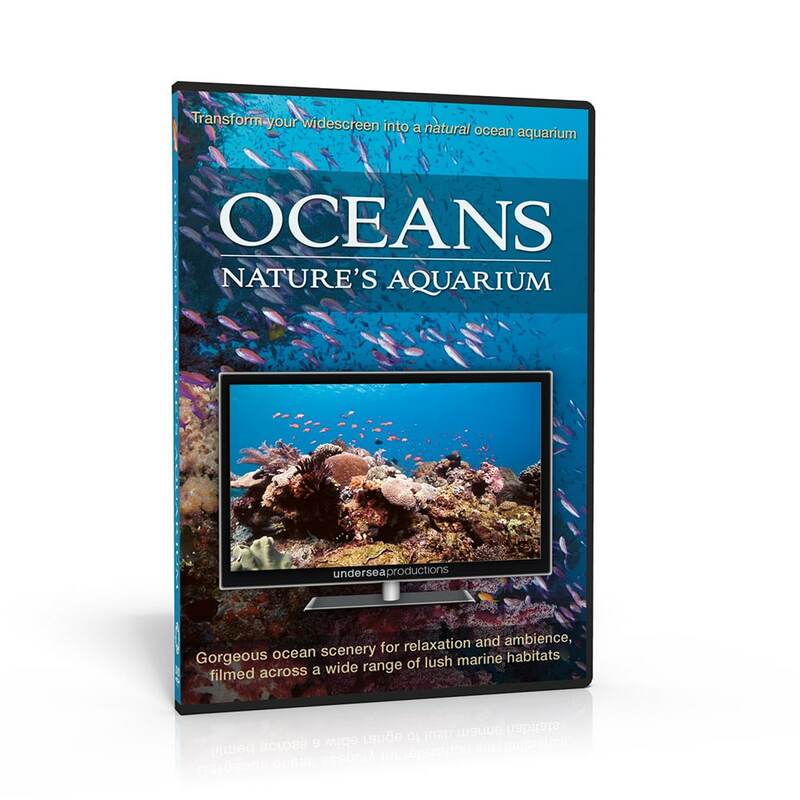 The main feature of Oceans: Nature’s Aquarium is available as a High Definition download (buy or rent) from Amazon.com, Amazon.co.uk, Amazon.de, and Amazon.co.jp. This DVD is beautifully filmed. There is a lot of variety in the scenes, they are all peaceful and interesting.